Former Uttar Pradesh cabinet minister Babu Singh Kushwaha, once considered close to Chief Minister Mayawati, on Saturday accused a state minister and two bureaucrats of conspiring to kill him. In a letter shot off by him to the Chief Minister, Kushwaha has expressed threat to his life from his former cabinet colleague Naseemuddin Siddiqui, as well as the cabinet secretary and the state home secretary. Kushwaha has named cabinet secretary Shashank Shekhar Singh and principal secretary (home) Fateh Bahadur Singh in his letter to Mayawati on Saturday. The BSP has denied the charges, and expelled Kushwaha from the party. Kushwaha is one of the key accused in the CBI inquiry into the murder of two chief medical officers (CMOs) and one deputy CMO in connection with the NRHM scam. Thousands of crores of rupees have been siphoned off in this Centre-sponsored rural health scheme. 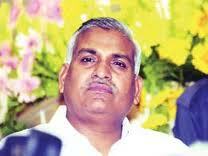 Kushwaha resigned as family welfare minister on April 7. In his letter to the chief minister, Kushwaha said PWD minister Siddiqui and the two top officials had been plotting against him ever since the BSP formed government in 2007. “These people can fabricate cases against me and my close relatives. They are such enemies that they can also get me eliminated,” Kushwaha said.